Many property owners would not like to come across a termite infestation. It is quite difficult to identify signs of termites infestation as termites like damp, dark, and warm areas of a home. The national pest management authorities recommend or advise people to beware of termite infestation. In the United States of America, the problem has been rampant over the years and many people are looking for solutions. If termites are not combated early they can cause humongous losses, Americans spend close to five billion dollars in termite damages annually. Termites typically are small-white-soft-bodied insects, which feed on wood. There are two species of termites: the dry wood termites and the subterranean termites. They usually live in a form of groups and societies, wings are an indication that the termite is reproductive. The termites live in colonies and once the little termites grow to a certain extent they form a swarm, which is a moving crowd, and maintain a colony. When signs of termites infestation is not noticed earlier, the damage can escalate to a higher level, which can affect the structure of the building. Most people see the termites when they have caused structural damage, which may cost them thousands to repair. It is essential for a property owner to beware of the termite infestation as early as possible to avoid losses in the future, as they, can put preventive measures or seek pesticides to kill termites. 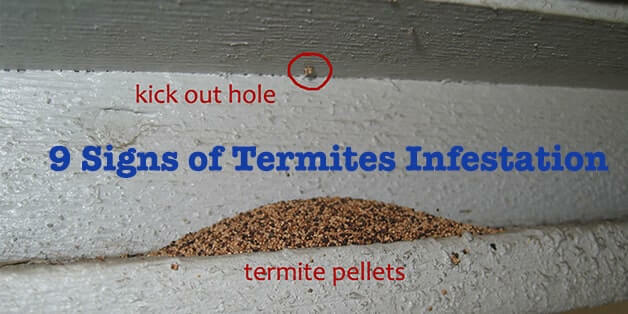 Here are some of the signs of termites. These mostly originate from the ground crossing barriers for example metal capping and on walls or foundations. The tubes are important in protecting the termites from predators, maintains a dark and humid environment for the termite food storage and their development. The termites are unique creatures and construct the structures at night when they are less likely to desiccate, in most cases the structures are clay like in texture , brown or dark brown in color. Some are narrow while others are wider, if they are narrow say 10 millimeters they contain soldiers and workers foraging for food. On the other hand, if they are wider say 50 millimeters then they consist of large numbers of workers and soldiers transporting food and this is the stage, which is the most destructive. The subterranean species on the other hand do not make shelter tubes however, they make subterranean tunnels where they search and transport their food. The tunnels maybe up to 20 centimeters deep down the soil with radii of up to 50 meters although in some cases this maybe deeper and radii further. Tunnels are mostly used by the worker termite although in some cases soldiers may be visible inside them. This is for both termite species but the most visible is the subterranean species, which forms their colonies in tree root crown and trunks. When an enemy infests the termites or predator the alates cut a longitudinal slit on the trunk for exit, however then the fight is completed the worker termite seal the hole and in most cases the tree produces callus in response to injuries. In wood a hollow sounding studs maybe heard if termites have infested, in this case a professional maybe of great help, as they are familiar with the termite pattern and living. Termites working inside a timber often produce a mud like earthen packing on the surface and this is mostly visible on the foundation walls or at the joints. In most cases, both termite species can cause destruction of the foundations and the joints. 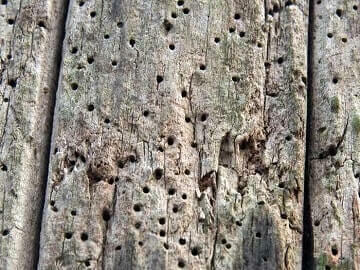 When an alates for colonizing fight is about to be released the termites often produce earthen flight tubes, which projects horizontally from the infested timber. This is the most crucial signs of termites to watch. Termites often excavate the wood leaving a thin layer intact and most excavation varies from large galleries to hollowing depending on the termite species. Audible tapping may be heard in places where it is heavily infested by termites these are signs of termites. The sound comes from the soldiers tapping their mandibles and heads on the wood this is to signal the rest of the colony. The continuous transfer of the signal to the rest of the termite population often increases the sound hence the reason why it can be heard. Termite droppings are often referred to as frass, these are tiny pellets mostly found at or near the entry of the termites. In the event you find a pile of dropping outside or inside your home then it clearly indicates that there are termites around. Reproductive termites are often referred to as swarmers and often take flights in order to look for places to create new colonies. 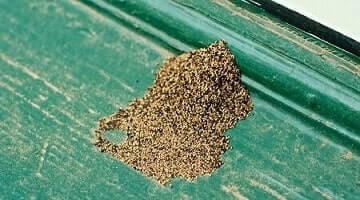 Dry wood swarms are less predictable while the subterranean termites swarm during the spring season. In the event you see discarded wings or a swarm of insects then this is the time to alert insect or termite specialist to check presence of termites. Termites burrow into the wood in an honeycomb pattern without coming closer to the surface; this is one of the problems why early detection is difficult. As they continue to burrow they make the wood significantly weaker and results in hollow sound and sagging floors. As a precautionary measure, one should walk around the wooden floors or walls while tapping them to identify the hollowness or termite infestation. 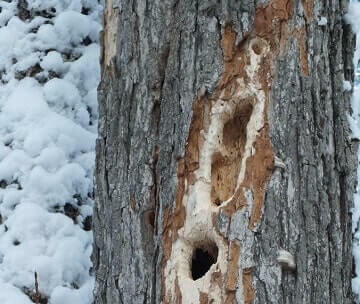 Some termite species make nests in the hollow center of the tree root or trunks this often makes it difficult to detect them. However, when the nest is operational or has aggravated to a large-scale chunk of mud is visible from the outside. 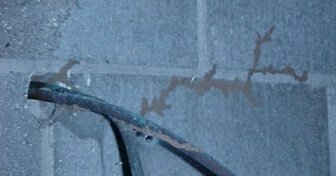 This indicates a heavy termite infestation hence the need to look for a solution to the problem. This is one of the signs of termites infestation in your house. In summary, there are many signs of termites infestation and they vary from one region to another and they should be closely monitored to avoid losses.